What Does Regional Diversity and Inclusion Look Like in Flyover-land? A look at the South Bend — Elkhart Region’s approach to diversity and inclusion. Our region is best known for two of the most innovative engines in the country — Notre Dame and the RV Industry. It’s only natural that a region grounded in innovation be ripe for the most innovative opportunities, those that come through diversity. Companies that have more diverse management teams have 19% higher revenue due to innovation. we engage with community organizations, chambers, business owners, and community leaders from five different counties — Elkhart, Marshall and St. Joseph in Indiana and Berrien and Cass in Michigan to develop strategy and implement SMART actions. The South Bend — Elkhart Region is filled with great collaborations, especially between companies and nonprofits. For example, the Acts of Kindness initiative that has lead to an increase in volunteer hours and employee engagement in Elkhart County. The D&I Committee brings together individuals and entities from industry sectors ranging from advanced manufacturing to healthcare to social services. By having diverse perspectives on what issues need to be addressed, we are able to present different solutions. Diversity is a business philosophy. looking at how diversity of thought impacts a business’ bottom line, how an inclusive environment drives the workplace of the future. Chambers of Commerce, including Goshen and Elkhart, have taken the necessary step to include diversity initiatives in their efforts. Companies, like Lippert Components, have programming around Cultural Integration. We are building on this momentum to share the business case for diverse recruiting, management, and leadership. It’s focused — hyper focused. We want to increase the number of minorities and women in leadership positions and in positive news with the outcome being that the more people see themselves in positive positions, the more likely they will follow down the same path. Mentorship and Sponsorship: Develop sponsorship opportunities for minorities and women. Sponsorship defined as a sponsorship is similar to mentoring, but it is almost a higher level of mentoring. Unlike with mentoring, the sponsor should be a person with a high status in an organization who can advocate for an individual’s future successes. Entrepreneurship: Increase the number of minority and women owned business in the region and build capacity of those already in existence. Networking: Increase the visibility and networking opportunities for minority and women leaders. Partnerships: Leverage existing programs, organizations, and companies to create cohesive momentum on a regional scale. 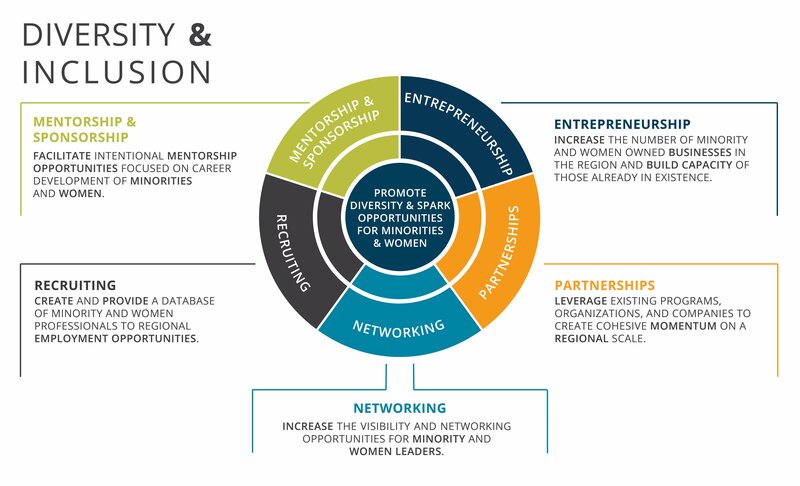 Recruiting: Create and provide a resource pool of minority and women professionals to regional employment opportunities. Improve South Bend — Elkhart Region’s national Metropolitan statistical area (MSA) percentile rank of minority income disparity from the 15th percentile to the 80th percentile by 2025. To promote diversity and spark opportunities for minorities and women. While this may be a lot to digest, it’s an exciting journey to be a part of and one that will only continue to build as the South Bend — Elkhart Region grows!